You are a horse lover and would like to have your dressage horse at home? Your pleasure with this animal is something very special for you and you would like to share it with your guests? At pferdekunst.com you will find unique reproductions of horses in the traversal, pirouette or piaffe in the dressage arena. In her horse paintings, the artist Kerstin Tschech attaches particular importance to expression, liveliness and individuality. Whether Oldenburger, Westphalian or Hanoverian, there is hardly a breed that the artist has not yet brought to life on her canvas. In dressage, special attention is paid to the body tension of rider and horse in order to perform the tasks exact. Especially this expression and elegance is what the artist tries to convey to the viewer in her dressage paintings. 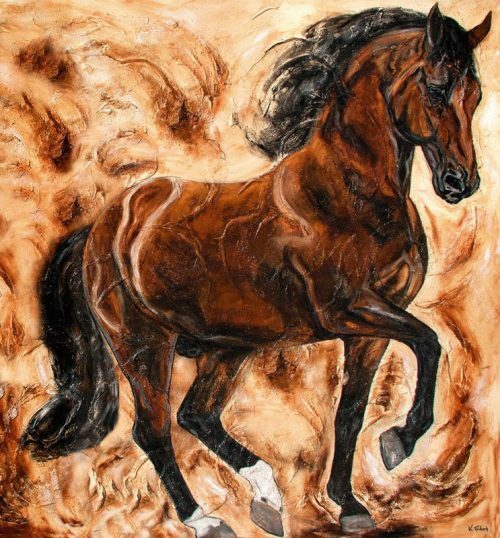 The horse artist has painted several portraits of horses that belong to the international top elite in this sport. Some of the horses come, for example, from the breeding of Paul Schockemöhle or the Max Theurer family, for whom the artist has already worked several times. 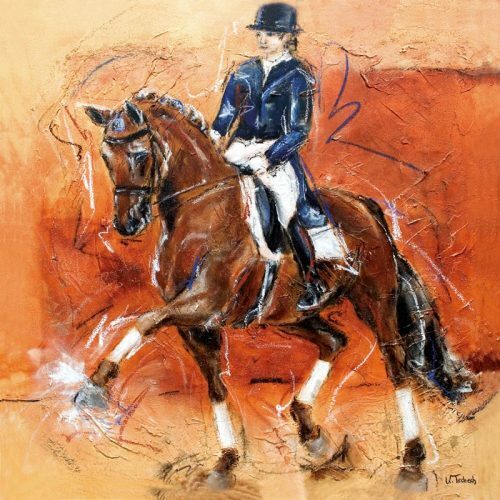 But also for representatives of classical dressage such as Anja Beran or for the Spanish Riding School she has already created horse paintings on commission.